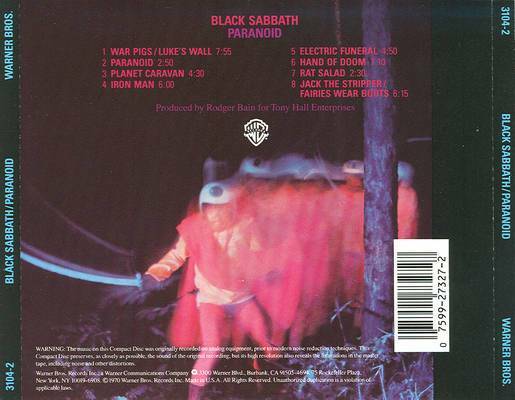 The original name of this album was to be War Pigs, but it was changed due to perceived hostility the album might have gotten due to the Vietnamese War. 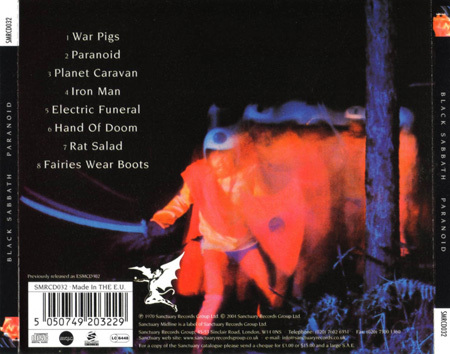 The original name of the song War Pigs was Walpurgis, and had totally different lyrics. 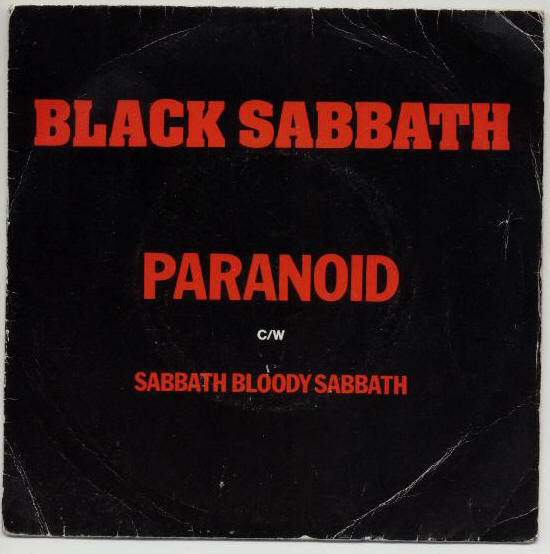 There were music videos for the songs “Iron Man” & “Paranoid” culled from the Beat Club footage. The song Paranoid appeared in a slightly altered format in the arcade videogame “Rock & Roll Racing” along with the songs Born to Be Wild & Bad to the Bone. 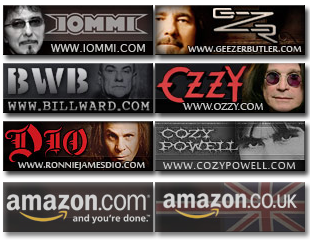 Yes, it’s Ozzy singing Planet Caravan. The song “Paranoid” was the last one written for the album, and was intended as a filler song. Only took about 25 minutes to write the whole thing. 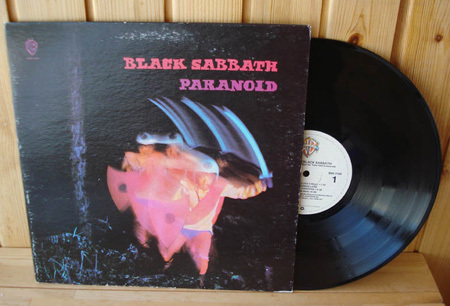 The album’s first recording session was June 1970. 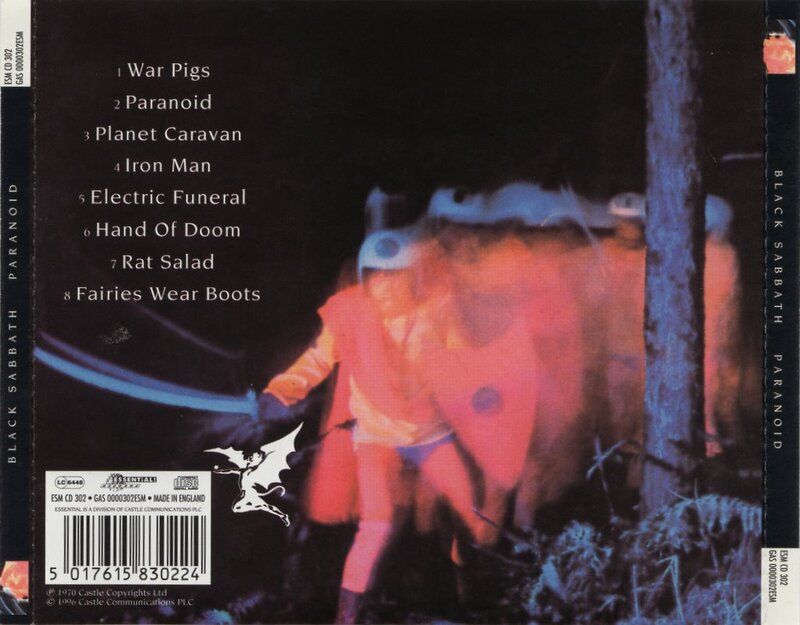 The original working title for the song “Iron Man” was “Iron Bloke”. 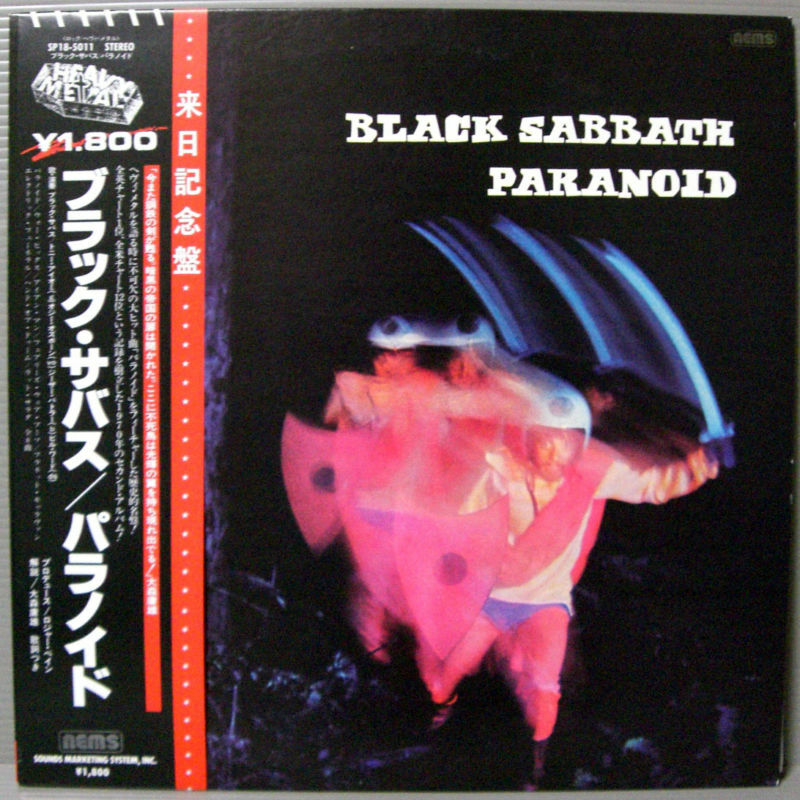 This is a picture of the very rare “reel to reel” release of Paranoid in the United States from 1971. 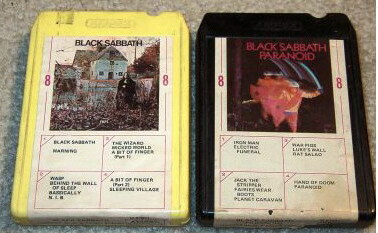 Here is a picture of an 8-track of the album, along with the first Sabbath album. 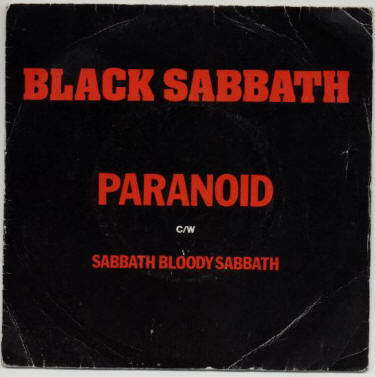 This is a scan of a 7″ single of Paranoid released in 1977. 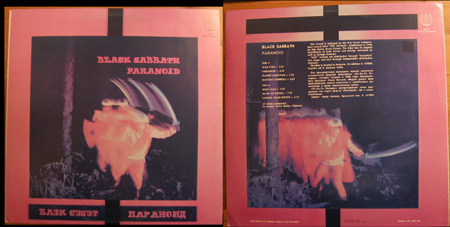 Below is an image of a Russian vinyl version of Paranoid from SNC Records. 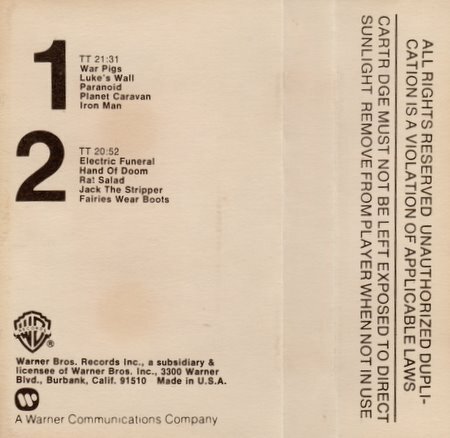 These are the CD backs of the original 1987 US Warner Bros release, the 1996 Essential release, the 2004 Castle re-release, and the 2009 Deluxe Edition. The 1996 & the 2004 versions are pretty much the same thing, just a re-release with no other changes. 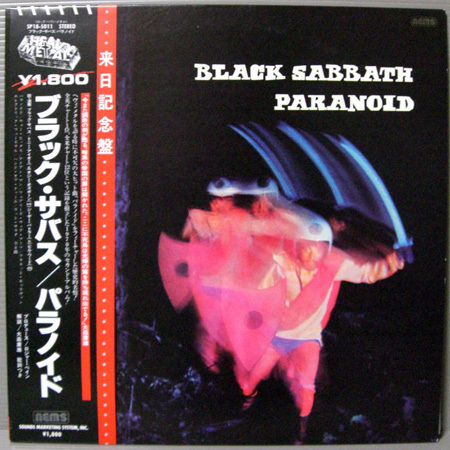 The following is a scan of a Japanese release of the album. 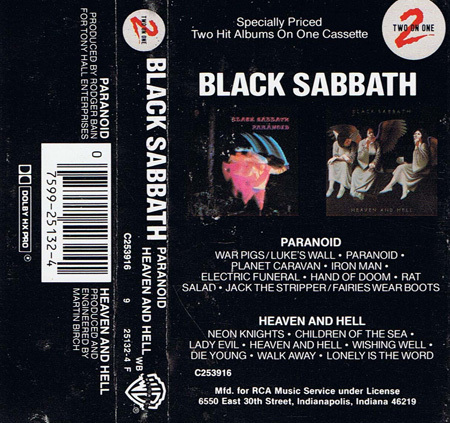 This image is from a cassette tape release by Warner Bros in the early 80’s that had both Paranoid and Heaven & Hell on the same cassette tape. NOTE: These lyrics (with the exception of Walpurgis) are verified against the lyrics that appear in the “Black Box” booklet. 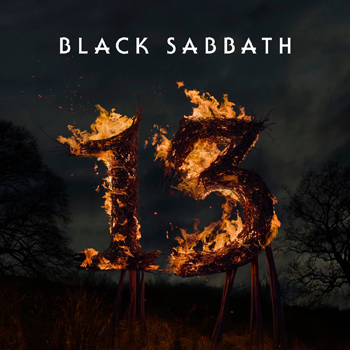 Those lyrics were gone over by Geezer Butler (who wrote most of them anyway) for that set, and for that reason should be considered definitive. One picky point to bring up, The photo including the album label can not be from 1971. In ’71 Warner’s was using the green label. Label in the photo is more from 1977. I am used to the UK copy on the original Vertigo label, however; I have been alerted to the existence of Jack the Stripper as a prelude to Fairies wear boots which appears on the label only of the US released on WB. Jack the Stripper was the name given to the undetected murderer of several women in London during the 1960’s. Why this detail appeared on the US release and not mentioned on the UK LP is very interesting. I wonder why? As the war machine keeps burning”. The second part should either go “Ashes where the bodies burning”, or “As is where the bodies burning”. Can somebody look in to that, please? I’m not sure if it’s ‘Ashes’ or ‘As is’, but that line is definitely wrong. Thanks!! Equally as good as the first one. 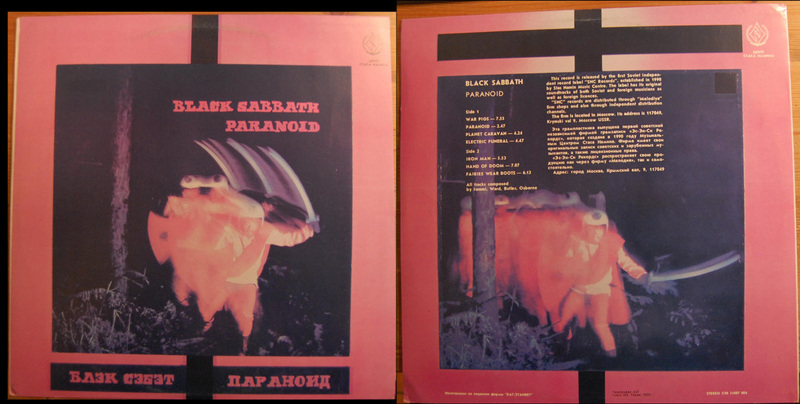 Side A is so overplayed, though. And don’t get me wrong, I love Side A, but after hearing Iron Man so many bloody times it just starts to get annoying. I’ve heard war pigs so many times as well, but not to the point where I got sick of it. 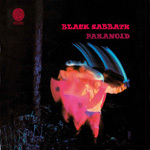 I used to listen to paranoid (the song) on repeat, so it’s my own fault if I’ve heard it too much. Planet caravan is the only exception. But side B is where I fell this album really starts to shine. Electric Funeral gets me pumped. 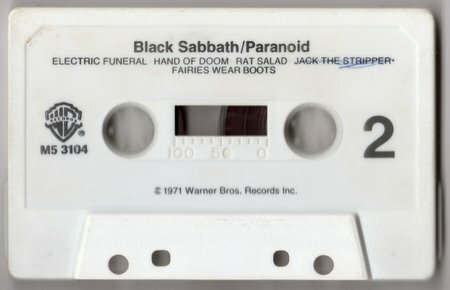 Hand of Doom is my 2nd favorite Sabbath song ever. Rat salad is mind blowing. The last track is a bit over-played, but still an awesome track. I once found a “Paranoid” “2-sided” cartridge. 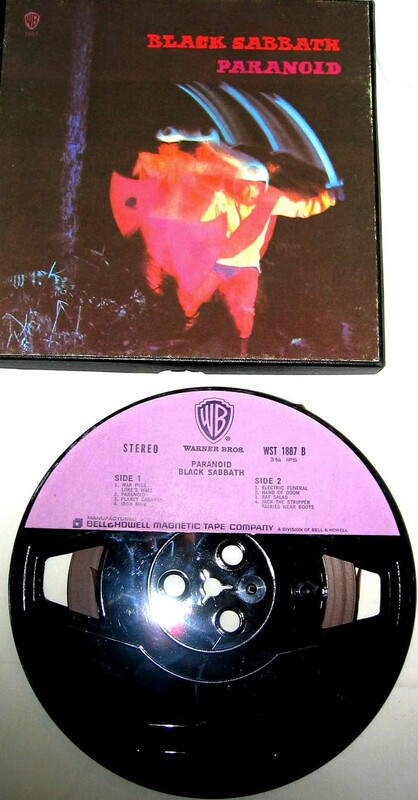 That is, the shell was just as a regular 8-track tape, but consisted of 2 programs not 4. 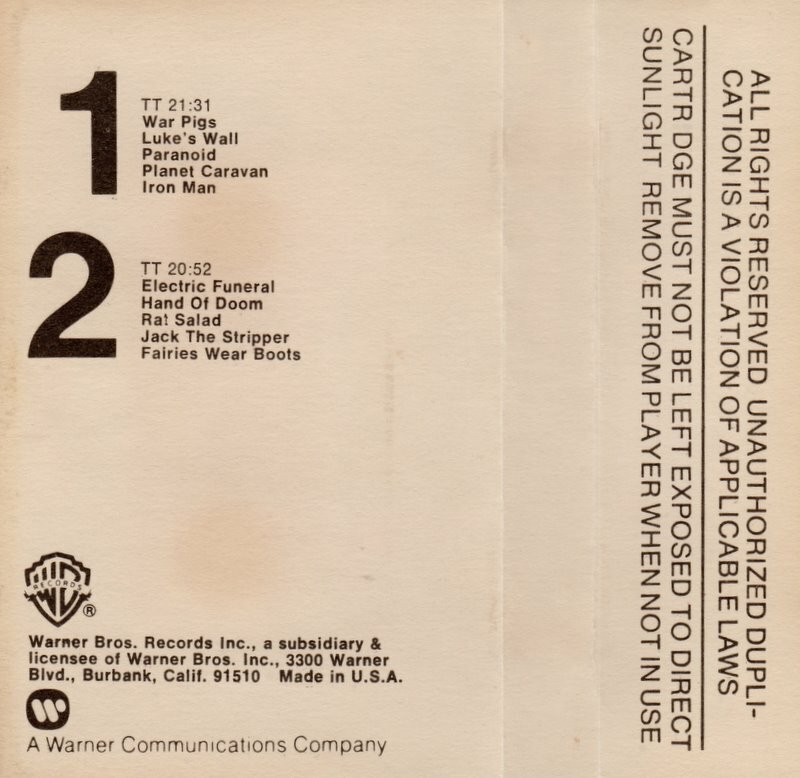 It was from Warner Bros with an additional “Q” logo. I presumed that meant quadrophonic. Paranoid was the first Black Sabbath album I bought on January 1, 1995 along with Metallica’s Black Album. I heard Headless Cross first which was given to my brother from a friend in 1993 then Live At Last in early 1994 then I got We Sold Our Souls For Rock and Roll as a Christmas present later in 1994. 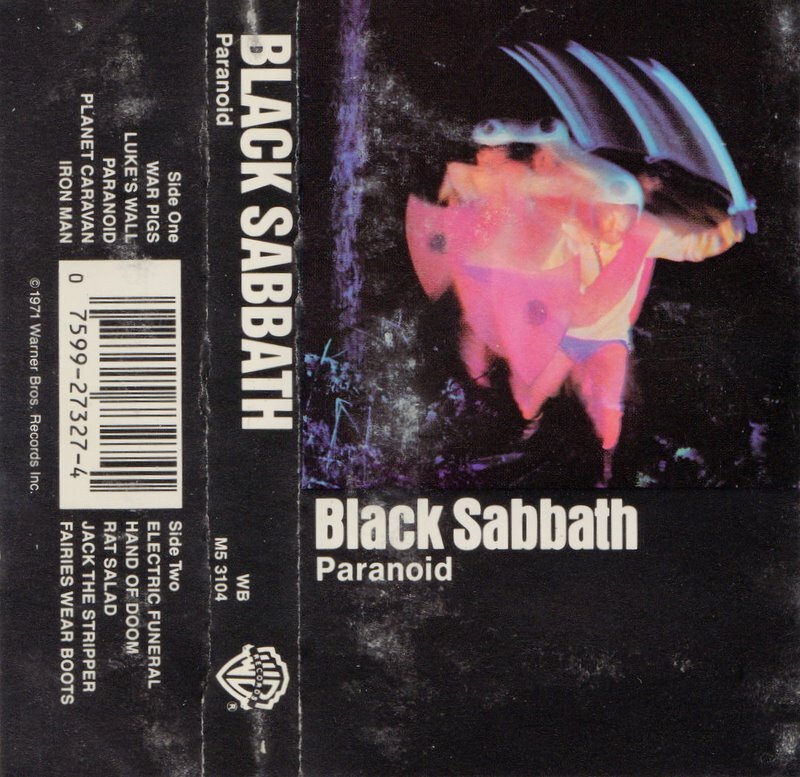 This makes Paranoid the very first Black Sabbath full legnth studio album I bought and yes, I do remember buying it on New Year’s Day, 1995. I couldn’t get into Planet Caravan at first because I thought it was too strange but I later got into it in time. I also loved Hand of Doom and Rat Salad. I finally had the honor of hearing Rat Salad live two years ago. Of course, Warpigs, Paranoid, Iron Man, Elecrric Funeral, and Faries Wear Boots are timeless classics. 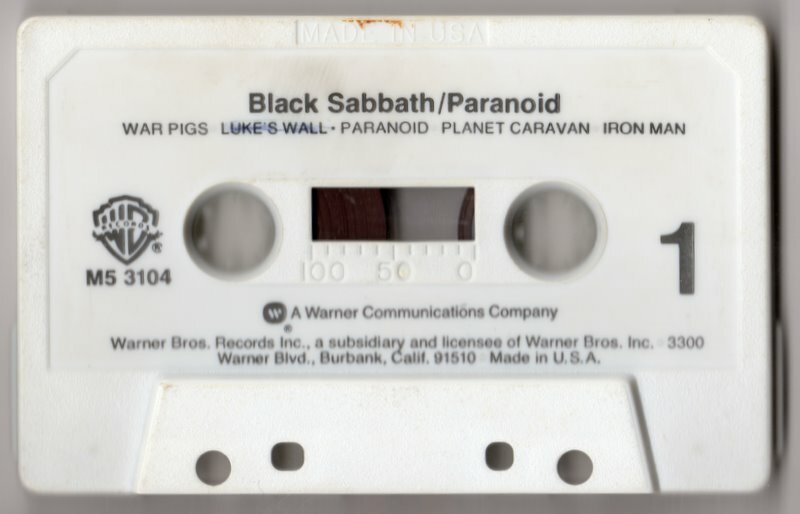 I remember singing Warpigs, Paranoid, Iron Man, and Faries Wear Boots on the bus on the way to school and not caring who I annoyed though I wouldn’t sing outloud if I could change that unless it was at everyone’s request. 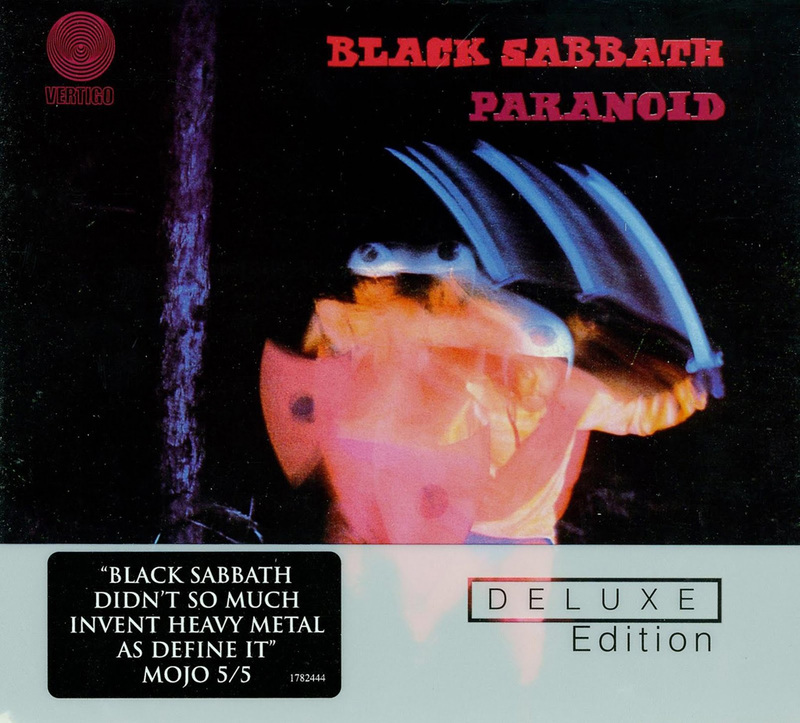 Looking forward to the addition of the “Super Deluxe Box Set” of Paranoid being added here. Those two ’70 concert CD additions are just remarkable in sound! Worth the price of the “Super” alone. The audio track listing for the DVD is slightly misleading; there’s only two audio tracks on the disc, I’m guessing the 5.1 DTS track is supposed to be the 4 channel mix. Unfortunately I don’t have a surround system so I have no idea if they’ve actually remixed it to fill in all channels or if the center speaker is simply silent. It is possible to have a pure 4.0 audio on a DVD, but I guess they went with the DTS to get full bitrate (which I also can’t verify). If someone with better equipment could figure out what’s actually going on with the DTS track, that’d be great.